We are nearing the end of this series, as this is the second to last post. I have finished the book, and this week I’ll be looking at the last few chapters dealing with the last attacks at Franklin and the aftermath of the battle. The controversies are few in these last several chapters, so this is more of a summary than anything else. Next week I hope to discuss pricing, the maps, durability of the book, notes, bibliography, and index. A review should follow not too long after that. Bate, the last of Cheatham’s division commanders to go in, attacked after the sun had already set. He was delayed by moving around an extension of Winstead Hill, and the attack first hit near Everbright Mansion near the Yankee right center. Chalmers’ Cavalry was not supporting his left as expected, so Bate moved his reserve brigade of Floridians to cover that vulnerable area. In truth, says the author, Chalmers did engage the enemy further to the left, but Bate could not see the cavalry due to the rolling terrain. Chalmers went in around 4:30 against the Union brigades of Kirby and Whitaker, assuming incorrectly that the firing further east was Bate’s Division. It was instead the attacks of Cleburne and Brown that Chalmers had heard, and his movement was premature. In any event, Chalmers’ attack was over quickly, and it happened before he could keep pressure off of Bate. Jacobson is not impressed with Hood’s use of Forrest’s cavalry at Franklin. The author criticizes the Southern leader for not even allowing Forrest a chance to flank the enemy, but for reasons discussed in the last entry I don’t believe there was enough time to act. However, Jacobson points out that Hood split up his cavalry into various widely scattered groups. Chalmers covered the left flank of the infantry and Buford covered the right, leaving only William Jackson’s Division to take on James H. Wilson’s entire Federal cavalry force alone. Wilson left all of his troopers north of the Harpeth except for John Croxton’s brigade, posted southeast of Franklin on the Lewisburg Pike. These men were to protect the flank of the Union column as it retreated through the town, but they were allowed to retreat across the Harpeth if pushed. That push started at 10 in the morning, but Croxton didn’t feel sufficiently threatened until 2 P.M., at which time he elected to fall back across McGavock’s Ford. Buford’s Cavalry wasn’t able to do much to support the infantry, says Jacobson. Instead, they were pinned down and could only skirmish with some of the Yankee horsemen across the river. Red Jackson’s Division, 2,000 men strong, now crossed the Harpeth a little to the east around 4 P.M. Wilson, expecting such a move, immediately sent Edward Hatch’s 2,800 or so troopers to deal with the problem. Part of John Croxton’s Brigade was sent along to help as well. The superior numbers and firepower of the Yankees (several regiments were carrying repeaters) made the difference, and Jackson retreated back across the Harpeth River around sundown. Jacobson again chastises Hood for dividing his cavalry command, but I disagree to an extent. Forrest himself said that he needed a division of infantry to make any flanking movement. If this had occurred, it would have both slowed down his column and weakened the main assault at Franklin. In addition, cavalry was routinely used to cover the flanks of a Civil War army going into battle, so I’m not sure the criticism in this case holds weight. Bate’s rightmost brigade, Henry Jackson’s, angled in the direction of the Locust Grove. Two Federal batteries started a crossfire on these men and were able to do massive damage during the charge. The Rebels also had to run through a valley…and then appear silhouetted against the sky near the Yankee works, where they were slaughtered. Tod Carter, son of Fountain Carter, was hit around this time. Jackson’s Brigade, aided by that of Benton Smith, continued to attack Moore’s Brigade of Federals. Two companies of the raw 183rd Ohio ran early, and the resulting hole made an inviting attack point for the Confederates in the area. Seven companies of the 183rd, earlier held in reserve, now moved up to support the main line. Two companies of the 80th Indiana, further to the right, were moved to plug the gap left by the two Ohio companies. In fierce fighting, the men of the 107th Illinois and 129th Indiana held with the assistance of the 183rd Ohio, who lay down behind the lines and reloaded for the veterans to their front. To the right, the 23rd Michigan accepted the help of the two companies of the 80th Indiana and they too held. As Smith and Jackson attacked Moore, Robert Bullock and his Florida Brigade assaulted along the Carter Creek Turnpike. Bullock faced William Grose’s Brigade of Kimball’s Division. The Floridians attacked over rough ground, and ended up traversing a creek in front of the Yankee lines as well. These men never came close to reaching the Federal lines, pinned down in a ravine from which they could not push forward. Jacobson discusses the controversy surrounding Bate’s Division, and exactly who among Jackson, Smith, and Bullock reached the Federal works. Some sources claimed Smith did not reach the Federal line, but after studying the situation, the author concludes that Jackson and Smith both managed to reach the enemy breastworks. However, he believes Bullock’s men, needing to travel a much longer distance over rough terrain, broke well before that point. When Bullock failed, Bate decided his division had had enough for one day and called off the attack. After Bate’s attack waned, the main portion of the fight sputtered to an end by 6 P.M. As Jacobson says, “Two Confederate corps had attempted to rout the Federal army and drive it into the river. Six divisions had tried everything in their power to bring about victory. The Union defensive perimeter, though badly damaged in spots, had held.” Jacob Cox, surveying his works, noticed that the Confederates still held a portion of the main line west of the Columbia Pike. He ordered the 112th Illinois up from reserve to attempt to retake it. While those troops were moving up, Captain James Sexton of the 72nd Illinois independently had his men attempt the same thing. This unit reached the main line, but friendly fire from the rear forced them back to the main line. When the 112th Illinois reached the front, Sexton was ordered to attempt the same thing with both regiments, and the other Federals in the vicinity were told what was about to happen. It made no difference. The expanded attack failed as well when the jittery Federals again fired on the Illinois regiments. The 44th Missouri, a little to the west, also made an unsuccessful assault bent on retaking the main line. Darkness had fallen, but the battle was not yet over. S. D. Lee reached the battlefield around 4 P.M., slightly ahead of his troops and just as the Confederate attack jumped off. He reported to Hood and was told to get his men ready to assist if needed, specifically Edward Johnson’s leading division. Lee went to find Cheatham, only succeeding around 5 P.M. Cheatham said he badly needed reinforcements, so Lee moved Johnson’s men forward. Lee did not know where to attack, and Cheatham told him he could be of no help because all of his aides were dead. As the author states, this must have been a serious warning flag for Lee. Instead, Cheatham told Lee to send Johnson in to the left of the Columbia Pike and move toward the flashes of muskets in front. Hood also ordered Lee to prepare Clayton’s Division to go in as a reserve. Johnson formed his division in two lines. 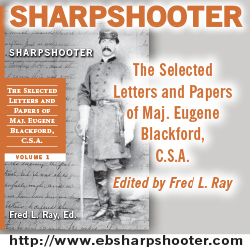 Sharp’s and Deas’ Brigades were in the front line from left to right, and Brantley and Manigault formed the reserve from left to right. Jacobson describes Johnson’s brigades and brigade commanders as experienced, but he also points out the dangers inherent in a night attack. The Federals could see torches at the ends of the advancing Confederate lines, and they opened fire in the darkness. As Johnson’s Division moved forward, Brantley’s Brigade was shifted to the front line, and Manigault moved left to become centered in its reserve role. The attack hit home near the Locust Grove, and another bloody fight along the works ensued. Brantley’s Brigade suffered the heaviest casualties in the division, while Manigault and several others who assumed command in his brigade were killed or wounded. Johnson could see the attack was not going to succeed and he called it off. Interestingly, S. D. Lee was initially not impressed with the role Manigault’s Brigade played in the attack, but later he praised the unit along with Johnson’s other three brigades in his report. Johnson’s Division suffered close to 600 casualties with no resultant gain and Hood finally canceled the assault after four hours. The commanding general claimed that he called off the attack due to darkness, but as Jacobson says, this did not prevent Hood from sending Edward Johnson’s Division into the fight in the very same amount of light. There would be no more major attacks, but skirmishes and random firefights continued throughout the night. There was dissension in the Federal camp despite the victory. Schofield was determined to retreat, and gave orders around 7 P.M. for his troops to start pulling out at midnight. Jacob Cox, on the other hand, was convinced that the Federals could hold out in their Franklin enclave indefinitely, and that Thomas and the reinforcements could come to them. Schofield, citing Thomas’ orders (which he had been begging for obliquely over the last few days, incidentally), made up his mind to retreat. Other Federals agreed with Cox, and Jacobson speculates Thomas might have even agreed to allow Schofield to stay had he asked. Apparently the retreat orders were being formulated even before Hood’s last attack slammed home. The Union artillery started leaving around 8 P.M., and seven of eight batteries along the main line were withdrawn before 10 P.M. The sights, smells, and sounds of the wounded, dying, and already dead were horrific in the aftermath of the battle. The author covers quite a few scenes relating to this experience, none of them pleasant. The ratio of killed to wounded was abnormally high because those who had been wounded earlier were repeatedly shot after the deadlock around the main Union line. Some men managed to find souvenirs among their grim surroundings. It was clear that the Confederate Army was finished, mentally and physically. Carnton, a large plantation belonging to the McGavock family, was used as a field hospital following the battle. Carrie McGavock, the owner’s wife, became known as the “Angel of Carnton” due to her tireless efforts to minister to the wounded. The Federal infantry pulled back as planned around midnight. Despite some confusion about the order of retreat between Wagner and Kimball and a fire that broke out in town, the retreat went through without too much incident. By 1 A.M., the skirmishers placed out front to cover the retreat were ordered to the river as well. Wood’s Division took the rear and burned the two bridges over the Harpeth River around 3 A.M. They waited until the bridges had burned for awhile, but the last Yankees were gone by 4 A.M. Wilson’s Federal cavalry stayed on the Harpeth near the flanks until 6 A.M., when they also pulled back and covered the moving infantry column. Jacobson says that despite no mention of it in his memoirs, Hood wanted to attack on December 1. He called a meeting at his headquarters and his corps commanders and staff attended. According to multiple sources, Hood had ordered an artillery bombardment for 7 A.M. to be followed two hours later by an infantry assault. 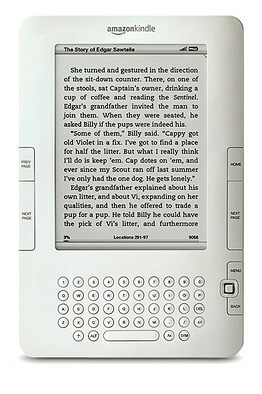 The author calls this idea by Hood “astounding” given the shape of the Army of Tennessee. One of A. P. Stewart’s staff officers discovered that the Yankees had retreated during the night, and he reported this fact to his superiors. After seeing the bridges on fire in the distance, the Confederates tried to bombard the remaining Yankees, but succeeded only in damaging civilian homes in the town and adding to the misery. The Federal force, as at Spring Hill, had again escaped in the direction of Nashville. There would be no more stops along the way. As the sun came up on December 1, 1864, the Confederates saw just how horrible the previous late afternoon’s fighting had been. Bodies covered the battlefield along with the screams of the wounded. Many Confederate memoirs are filled with attempts to describe the carnage, or telling of the outright impossibility of a true description. In one case, an officer’s horse refused to ride through the bodies, spooked by the strong smell of death. The Carter family at first believed they had come out lucky, since their house was still standing and in pretty good shape considering what had just happened. Then they learned that Tod Carter had been mortally wounded and was within 200 yards of the house where he was born. Carter died on December 2 and was buried shortly thereafter. The Confederates began burying the dead, starting with their own men. They tried to identify individual soldiers on their side, but simply buried most of the Yankees with no attempt at identification. Capt. John McQuaide and Chaplain Thomas Markham found Patrick Cleburne’s body on the battlefield, “40 or 50 yards from the works.” Many of the Confederate generals who had been killed were laid to rest near St. John’s Episcopal Church in Ashwood Cemetery. St. John’s, located in Columbia, had been the place Cleburne had seen when he made the remark that it wouldn’t be so bad to be killed if he could rest in a place like this. Quite by accident, that is exactly where he ended up. Hood rode over the battlefield, and although he tried, he was unable to contain his emotion when he saw the horrible sight of the dead lying everywhere. Jacobson writes that emotions ran high in the ranks as well, with feelings ranging from sadness and despair to anger. The author then discusses Confederate casualties at the battle. Apparently casualties are not specifically known in the divisions of Cleburne and Brown, but the author estimates Cleburne lost over 50% of his men, around 1500 in all, and Brown lost 31%, or 1150. Bate, also of Cheatham’s corps, lost 319. In Stewart’s Corps, Loring lost 876 men, French 652, and Walthall 580. And in Lee’s Corps, Johnston’s abortive night assault cost his division 587 soldiers. From these calculations, Jacobson estimates that the Confederate army lost at the very least 5,800 men in just a few short hours of fighting and in a very concentrated area of land. However, the author goes on to establish that from reports of Federals trying to determine Confederate losses at Franklin, this number jumps to at least 6,252. Still, given the return to the ranks of slightly wounded men, the author thinks even that estimate is too low. Official Federal estimates placed their killed, wounded, and missing at 2326, though the author thinks the reported total of 189 dead is too low, estimating that as many as 300 Federals could have been killed on the field of battle. Franklin accounted for at least 8,500 total casualties, and the number of Confederates killed outright was shocking compared to other well-known battles. Hood lost more men killed than the South lost at Shiloh, than McClellan lost during the entire Seven Days, than Lee and Pope each lost at Second Manassas, and even more than Burnside lost in the bloodbath at Fredericksburg. As Jacobson says, considering the short time span of the fighting (two hours of pitched battle followed by three more of sporadic fighting), “it was a bloodbath of unparalleled proportions…It was perhaps the greatest and most useless sacrifice of life the war ever witnessed.” The officer corps was decimated: six generals were killed, seven wounded , and one captured. (Note: Eric here made a mistake by saying that only five generals were killed. In an email exchange between reader Alex Krolikowski, Eric Jacobson, and myself, Eric mentioned that the error most likely arose when considering whether John Carter was killed or wounded. He intends to correct the error in the next printing.) Fully fifty-five regimental commanders were killed, captured, wounded, or missing. Jacobson lists these names, and they take up almost two full pages of text! Sixty-eight field officers in total were casualties, many divisions lost multiple brigade commanders as well. Jacobson calls the Army of Tennessee a “physical and psychological wreck” on December 1. The author believes the proper move for Hood at this point would have been to retreat or at most maintain his position in Franklin. Lee led the way to Nashville, Stewart was in the middle, and Cheatham’s devastated corps was allowed an extra day of rest. Jacobson extensively quote from Hood’s memoirs to provide, in Hood’s own words, why he moved on Nashville. To paraphrase, Hood felt that to retreat and wait for expected reinforcements from Texas would only see him return again to the vicinity of Nashville, but with the Yankees in much better position to receive his army. In addition, he hoped to save the ground he had already retaken by entrenching near Nashville, waiting for the expected reinforcements, and enticing the enemy to attack. Jacobson finds quite a few flaws in Hood’s reasoning. First, he calls Hood’s hope for reinforcements from Kirby Smith “a pipe dream”. Second, the author feels Hood was essentially gambling even more on the lives of his men, knowing they were in no condition to fight another pitched battle. Lastly, even if he did not know their exact strength, Jacobson says Hood should have realized that the Yankees would be reinforced at least as much as he was. Hood “bet everything on the long hope that George Henry Thomas might somehow slip up.” The author further condemns Hood for splitting his army, sending Bate’s Division (and later Forrest plus two additional infantry brigades) to Murfreesboro to tear up track to that city. Poor intelligence didn’t reveal the presence of a large Federal garrison there, and an attack led by Forrest failed. To make matters worse, Hood left Forrest’s cavalry near that town, cavalry that was greatly needed a week later at the Battle of Nashville. Hood was defeated on December 15-16, 1864 at the Battle of Nashville, and only the quick thinking and tactical skill of Forrest kept the Army of Tennessee from complete disaster. The Tennessee Campaign ended on Christmas Day 1864 as Hood’s army crossed the Tennessee River at Florence, Alabama. Jacobson goes into detail as far as the casualty figures for the campaign go. He believes Wiley Sword mistakenly counted Confederate prisoners twice, producing a much larger final total (6000 or so). The author puts the final Confederate total at just short of 16,000 men for the campaign, much larger than the 10,000 Hood claimed. This amounted to almost 40% of Hood’s army, a staggering figure even in Civil War terms. Hood sent in a request to be relieved from command and it was accepted on January 17, 1865. Most of what remained of the Army of Tennessee was shipped east to the Carolinas and fought under Joseph Johnston, trying to hold back Sherman’s advancing army. Hood never held another command, and to make matters worse for him personally, he called off his engagement to the beautiful Sally Preston due to the objections of her parents and sister. Hood surrendered to Federal authorities in May 1865. In a brief last chapter that would have worked well as an appendix, Jacobson discusses the fates of the men who fought at Franklin, the civilians affected, and the battlefield itself. Since no National Battlefield was created in the first half of the 20th Century, the town of Franklin soon engulfed the land around the Carter House and the Columbia Pike. Today the Carter House is surrounded by the present-day town of Franklin. The Union breastworks are long gone, having been pulled down and plowed over by Fountain Carter in his quest to return to normalcy after a horrific day. In these last few chapters, there aren’t really many controversies to discuss. Eric Jacobson does believe that Wiley Sword overestimated the number of Confederate casualties incurred in the campaign due to counting the number of Confederate prisoners by a factor of two, but once the Battle of Franklin is over for Cause and For Country summarizes the remainder of the campaign. 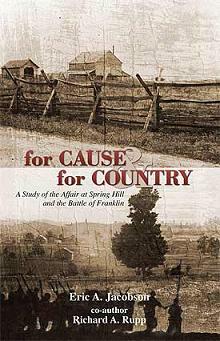 I’ve learned a great deal about Spring Hill and Franklin after reading The Confederacy’s Last Hurrah and for Cause and For Country back to back. The eighth entry in this blog series comparing and contrasting the views of Sword and Jacobson on Franklin was an especially fun and illuminating project. I’ve already ordered several books cited by the authors in the course of their books, and I hope to collect more on this interesting and controversial campaign. By the way, Jamie Gillum also has a book focusing on Spring Hill entitled The Battle of Spring Hill … Twenty-five Hours to Tragedy. In 286 pages, it covers Spring Hill and the actions at on the Duck River and at Thompson’s Station on November 29, 1864. It appears that the best place to order the book is directly from The Carter House. The Carter House Museum Shop’s phone number is 615-791-1861, and it appears to be the only place to find the book. It is not listed on the Museum Shop web page, but the book is available if you call since I was able to order it late last week. I hope to do one more entry wrapping up the series in the next week or so. Next week I’ll look at the Order of Battle, notes, bibliography, etc. and conclude everything. Look for a review of the book to follow shortly after that. For those of you who have stuck with me over several months, thanks so much! I’ve enjoyed the comments from interested parties, especially Sam Hood, descendant of the general, and author Eric Jacobson.